Each piece is unique with its own pattern. They have the typical TechStab Jewel 3D pattern with pure gold (24K) foils. What you see is what you get. 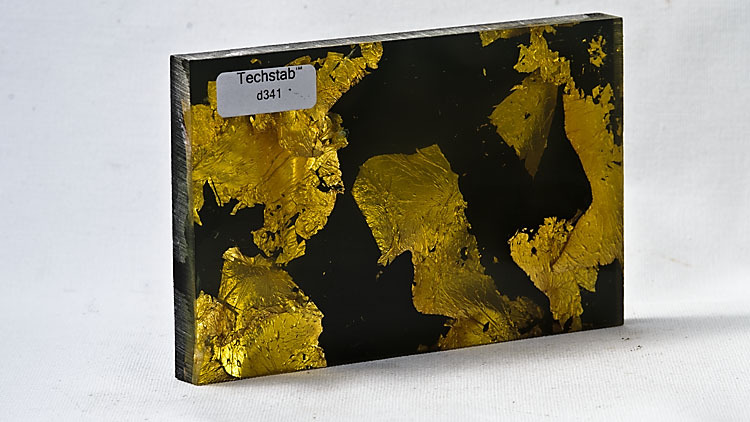 TechStab Jewel is a handmade modern composite material composed of 23,75 K gold foil embedded in epoxy with a visual 3D effect.TechStab absorbs no water, does not warp. It is therefore suitable for all areas where the material should not expand and contract. TechStab is easy to process with all cutting and abrasive tools. It is delivered with silkmat surface. You can grind it (optimally g 2000) and with a light touch polish it to a high gloss. TechStab is used for handmade knives, guns, jewelry and pens.